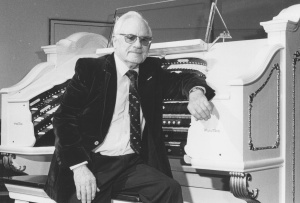 Jim Buckland, the creator of the Worthing Wurlitzer, passed away on December 30th, just a couple of weeks short of his 99th birthday. He had suffered a broken leg during a fall and, although the operation to pin the bone was successful, he died in hospital a few days later. 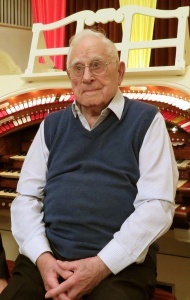 Jim was one of the pioneers of the Brighton Hammond Organ Society, but had the ambition to create a high quality theatre pipe organ in a public hall, an ambition that was realised with formation of the Sussex Theatre Organ Trust and the acquisition of the 3/10 Wurlitzer formerly installed at Buckingham Town Hall. 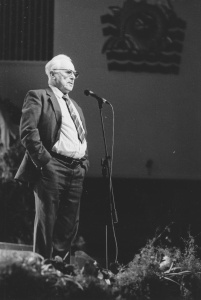 Jim used his skills and experience as a professional engineer to lead the team that meticulously rebuilt the organ and installed it at Worthing Assembly Hall, where it was launched in 1981. A continuing period of enlargement and refinement brought the instrument to its present high standard, being recognised as one of the finest Wurlitzers in the country. Jim invited leading organists from around the world to showcase the organ, not just as a solo instrument, but also in conjunction with the Worthing Symphony. 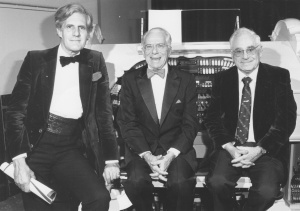 This included commissioning from Rex Koury, US organist and TV music composer, the world’s first Concerto for Theatre Organ and Orchestra, which was premiered at the Assembly Hall with Rex at the console. A determined and single-minded individual, Jim was not immune from controversy, not least for his decision to use parts from the former Blackpool Empress Ballroom Wurlitzer to enhance the Worthing instrument. But it is the determination to achieve great things and inspire others for which he will be remembered, and his legacy is a musical instrument that will continue to entertain and inspire for, hopefully, many more years.